MOSCOW, July 18 (Sputnik) – Afghanistan’s statement that Russia should apologize to the Afghan people for the decade-long Soviet military operation in Afghanistan “raises nothing but surprise and bewilderment,” Russian Foreign Ministry’s Second Asian Department Director Zamir Kabulov told Sputnik on Wednesday. Earlier in the day, Afghan Ambassador to Russia Abdul Qayyum Kochai said that the Afghan people want apologies for what he called were mistakes of the Soviet government in Afghanistan, including Moscow’s recognition of the communist leadership and the military campaign that started in December 1979. “The Soviet government recognized the new leadership in Afghanistan and was developing normal relations with it. The troops were deployed later, as a result of actions against that leadership. The statement [on Afghanistan expecting apologies] raises nothing but surprise and bewilderment,” Kabulov said, adding that Russia will not apologize to anyone. The offensive was dubbed a Cold War proxy conflict, with the Soviet army fighting US-backed militants in an attempt to ensure that the communist government led by Nur Mohammad Taraki stayed in power after the 1978 coup. 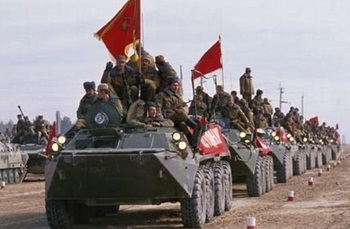 Soviet forces eventually left Afghanistan in early 1989.